My interest was piqued last week by a headline on the BBC News websitewhich announced that – similar to the lost grave of Richard III, recently unearthed in a Car Park in Leicester – the lost tomb of Miguel de Cervantes(1547-1616), the writer of Don Quixote, had been found in Madrid. Reading the article itself though showed that things perhaps weren’t quite as straightforward. 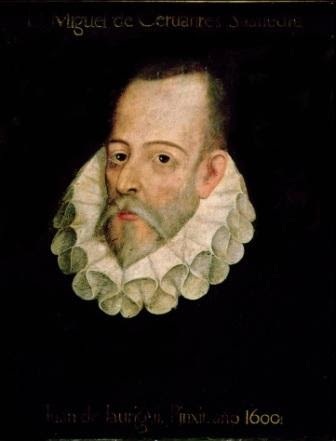 For whilst the facts seemed to suggest it was ‘quite likely’ to be at least some of Cervantes’ mortal remains which had been uncovered, they were actually in quite a bad state of preservation and were jumbled up with a number of other individuals too, some of whom might be his relatives – so it wasn’t entirely certain it was really him after all. Even though a wooden fragment of a casket bearing the initials ‘M.C.’ were tantalisingly part of the find, another article in El Pais gave a clearer account of the facts of the discovery. In response to this, a short piece in The Guardian asked: ‘Did it really matter if it was him or not?’ ... Good question. After all, a similar article in The New Yorker pointed out that whilst Cervantes is seemingly everywhere in Spain, he is actually nowhere – because so little is verifiably known about him. It’s true though. Travel to Spain and Miguel de Cervantes iseverywhere. He follows you wherever you go. Not least because his likeness adorns several of the various Spanish minted Euro cent coins which will undoubtedly be in your pocket. I remember meeting him on my very first trip to Spain in 2003. I was working in an art gallery in Valencia and every day, on our walk to work from the place where we were staying, my two colleagues and I would pass by a bronze bust of the man, his bearded face smiling affably at us as we strolled past in the early morning sunshine. Like most people, I had a rough idea of the story of Don Quixote, even though I’ve never actually read it. As with Shakespeare, Cervantes’ most famous work pervades European culture – it’s as if we are all born with a genetic memory of their words and leitmotifs. Hence the misremembered metaphor of my colleague in the meeting. Like Shakespeare, Cervantes’ verbal images and turns of phrase have permeated our unconscious because they have saturated deep into our language over many preceding generations. The idioms they each first coined have become our common cultural currency. An intimate link from their time to ours. A continuity of thoughts and ideas which binds us to them through time as similar people with shared experiences and feelings. This thought occurred to me once whilst walking on a London street when I heard someone passing by say “bless you” to a complete stranger who had just sneezed, and it occurred to me that this commonplace convention in our language first came into everyday parlance in 1665 – on these very streets – during the time of the Great Plague. It is realisations such as these, which, when I ponder them a little too long, never fail to send a shiver down my spine. 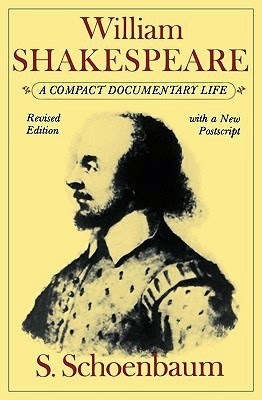 There is also a story which says that the reason UNESCO first decided in 1995 to designate April 23rdas ‘World Book Day’ (also, the Feast Day of Saint George), was because it was thought that both Shakespeare and Cervantes died on this particular date in 1616. What they overlooked though is the fact that in 1616 England and Spain were each using different calendars; England – the Julian, and Spain – the Gregorian. Therefore the dates (as uncertain as they are) do not quite match. But there is something ironically subversive in this garbled, misremembering of hearsay being transmuted – a fiction of coincidence burnished into solid, resolute fact – which deeply appeals to me … ‘Cry – God for Quixote, England and Saint George!’ … I can almost picture the two writers sitting together, wreathed in cloud, amidst the laurel groves somewhere at the top of Mount Parnassus – chuckling together, looking down on us all with wry grins beaming across their faces! But then, when so little is actually known about the day-to-day lives of such august historical figures – I think it is, in some senses, easier to make a greater personal connection to them. Reading the bare facts of Shakespeare’s life in Samuel Schoenbaum’s excellent William Shakespeare: A Compact Documentary Life (1987) brought the man back to life for me far more vividly than any creative work of the imagination, such that I felt I could imagine sitting in a wayside inn somewhere en routebetween London and Stratford-upon-Avon with him, having a chat over a couple of pints. 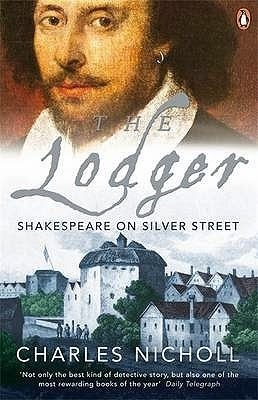 Charles Nicholl’s The Lodger: Shakespeare on Silver Street (2007) is a similarly evocative piece of scholarly detective work. We can perhaps more easily project our own ideas and images onto the blank parchment which is the only record left to us of their real lives. Whilst their literary works may now justly be held up as truly extraordinary, they themselves in their own times were perhaps just as ordinary as we are today. Oddly enough, it was again in 2003, having passed through Stratford-upon-Avon en routeto the Welsh ‘El Dorado’ of books at Hay-on-Wye, that I encountered Miguel de Cervantes again. In one of the dusty old bookshops there, I came across a little room which was filled with cardboard boxes of old prints – mostly loose sheets (hacked or salvaged?) which had been collated from old Victorian books long since before dismembered. 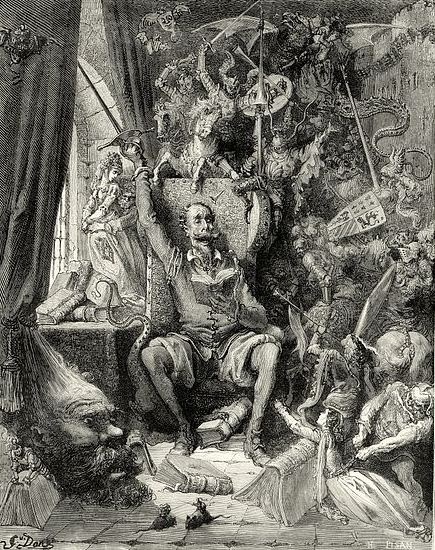 Amidst this treasure trove I came across sheaves of the famous illustrations of Don Quixote done by the artist, Gustave Doré(1832-1883). There were so many I couldn’t decide which I liked best, and I kick myself to this day that in the end I didn’t buy any. I’m sure I thought I’d go back before we left Hay, as we were there for several days – but somehow, for some reason, I never did. 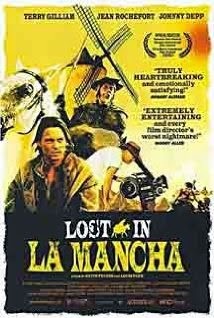 Those images of Doré’s, like the little statuette (which I think I bought in Toledo in 2009), reminded me of the film Lost in La Mancha (2002), a documentary about Terry Gilliam’s own quixotic attempt to make a film version based upon Cervantes’ tale which was bedevilled by misfortune and unhappy accident, and finally had to be canned only partially made. It’s an excruciating film to watch, not least (as I’m a big fan of Terry Gilliam’s films) because it looked set to have all the hallmarks of the outlandishly singular imagination which has marked the best of Gilliam’s films. As elaborately mad as one of Gustave Doré’s prints. I’m sure it would have been good.